A wet room can be an ideal solution for anyone with mobility issues who requires assistance when using the bathroom. In a wet room the entire floor area and the shower walls are waterproofed / tanked. An entire room can be turned into a wet room or just a section depending on room size and the requirements of the end user. Wet room floors can be tiled or fitted with a vinyl, safety floor such as Altro Aquarius. Walls can be tiled or fitted with wall panels such as Grant Westfield MultiPanel. Wall panels are proving very popular at the moment as the colour and pattern choices are extensive and will suit all tastes. Apart from the luxury of opening up your bathroom and creating a more attractive space, installing a shower where a traditional shower tray may not have been viable, a wet room can be installed on wooden or concrete floors, protecting your home from moisture damage and leaks. Probably the most important benefit of a wet room, is in providing people with a disability and wheel chair users easier access to the shower and bathroom. For more ideas and examples of our work please visit our Portfolio page. 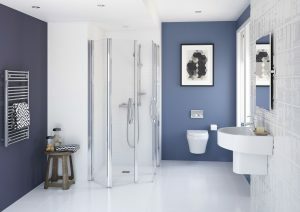 Nightingale Bathrooms' Wet Rooms are installed by fully qualified professionals who have many years experience in fitting wet rooms into all types of homes. They prove a perfect solution for those who find using a bath or traditional style shower trays difficult and unsafe. They can make even the smallest bathroom seem far more spacious. Wet Rooms can be installed with slip resistant safety flooring or traditional tiles and can be installed in most bathrooms. A wide range of shower screens and door combinations are available. These include fixed glass or polycarbonate panels finished in chrome or white and a variety of half height screen combinations where carer assistance is required. Give us a call free on 0800 566 8889 or complete our contact form, if you require more information or would like a surveyor to visit. We install throughout Kent and most of the South East. We chose Nightingale Bathrooms on recommendation. Having a bathroom installation can be stressful, especially when it is a wet room for use by somebody living with disability. If you choose this company for your bathroom installation there will be no cause for concern as the fitters will be very efficient, the quality of the installation of the highest standard and there will be no mess! The consideration to our needs in fitting the wet room, from the exact positioning of the grab rails for my disabled wife to the leaving his mobile number on completion in case we needed anything after using the shower for the first time, was exceptional. It exemplified the quality of the service provided consistently by your fitter.